There is no such thing as a quick-fix, get-rich programme… but this list of 10 things you should do in the next 10 days will significantly improve your business performance. Businesses that have followed the 10/10 ology significantly increase their sales and profitability. Most businesses need to look closely about whether they’ve got the “right things right” but in the meantime this quick ‘n’ dirty action planning session will invigorate you and your team to take action. 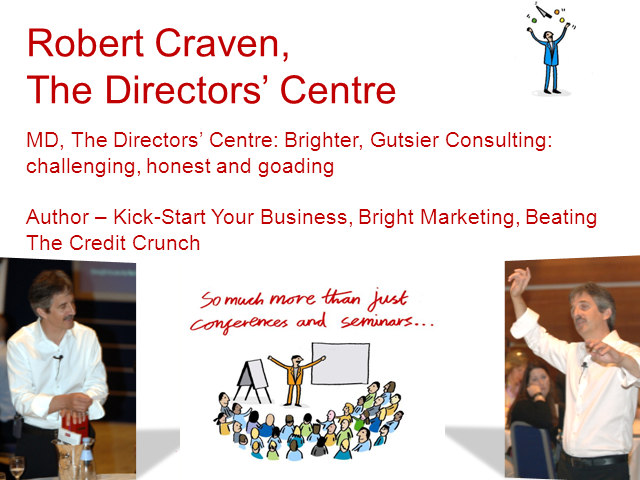 Robert’s quick-fire presentation is a concentrated version of his highly successful one-day and two-day events. He starts, ”spend one hour with your business partner…, take a blank sheet of paper… and make these tough decisions… then implement them, now”. MD of The Directors’ Centre, the consultancy for growing businesses, Robert is mentor and coach to a number of the UK’s leading entrepreneurs.